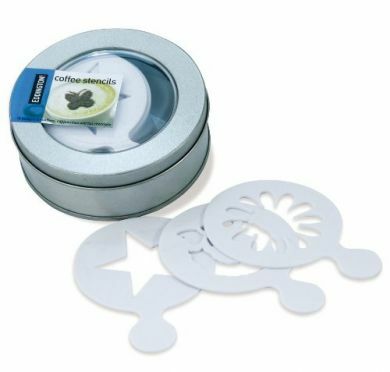 Get creative with the Eddingtons Coffee Stencils Gift Tin. Create fun patterns on your favourite hot drinks with the Eddingtons Coffee Stencils Gift Tin. This 9 cm gift tin contains 16 plastic stencils with different designs including a butterfly, heart, flower and more. Simply hold a stencil over your frothed milk and sprinkle some chocolate or cinnamon powder on the top. Each one measures 65 mm wide and are perfect for decorating lattes, cappuccinos and hot chocolates. You can even use them to decorate cakes and pastries. Each tin contains 16 plastic stencils. Each stencil measures 65mm wide. Perfect for decorating lattes, cappuccinos and hot chocolate.